In 1893, the historian Frederick Jackson Turner declared the Western frontier closed. The country had reached the Pacific, he said, and the intervening space was secured. It remained only to fill in the odd corners. With the loss of the Western frontier, the United States lost some of its distinctive character as well. A nation with a pioneer history and values was cut off from some of its roots. And with no new lands to settle, people began to develop more intensively the lands they already held, creating a conflict between the forces of preservation and development that continues to this day. It is time to take a bold but quite feasible step to address these problems. It is time to recreate at least one sizeable piece of the Western frontier under the name of the Bright Angel Frontier. This can be done in one of the large, lightly-inhabited valleys of the rural West. The valley would become a place for “historically oriented development” – a new type of use that would involve a mix of land conservation, historic preservation, and new construction on condition that certain historical models be followed. This course has several potential benefits. It can preserve the history of the nineteenth century and the pioneer West; provide an ideal environment for hiking, bicycling, and other outdoor activities; bring development and visitors to the local economy by creating what is much like a new kind of National Park; and offer the conservation community a large, contiguous block of land from which cars and electricity have been excluded. This idea will be discussed in more detail under the headings below. The discussion is divided into ten main sections. Those will deal with the following points: (1) the basic proposal; (2) the sequence of different towns; (3) the different types of land management that can be used between the towns; (4) the types of outdoor activities that might be supported; (5) the benefits of the frontier area to current local residents; (6) some practical issues of construction and finance; (7) the ways in which the valley can offer authentic forms of historic preservation; (8) ways to compensate jeep groups for their loss of access; (9) special features to encourage a sense of discovery and exploration; and finally, (10) a discussion of the practical next steps that might be taken to move this project forward. The basic idea is for a mix of land conservation and “historically oriented development.” The idea is to take some federal land that is presently empty, and there to privatize some small tracts for the creation of new towns. The twist would be that these towns would be limited to period nineteenth century architecture, and would not use cars or electricity. These towns would offer a unique view into the history of the West — the horse-drawn, kerosene-lit, quieter world of the nineteenth century pioneers. They would allow us to step through time and teach our children (and to rediscover for ourselves) what the world was like when the West was built – a time before television and easy transportation, when people built a different kind of community using a different technology. Creating such an area would let the host county showcase both its history and its natural beauty. This could greatly broaden the range of people interested in visiting. This goal might fit in well with the full missions of either BLM or the Park Service, both of which are intended to include the preservation of cultural history as well as natural features. All this could be done in a single valley, two to ten miles wide and twenty to eighty miles long. Six or eight small pioneer-era towns could be founded at intervals there, in such a way that civilization gradually “thins out” as the traveler goes farther along the valley, just as it did when the West was settled. The starting point would be in one of the existing towns, which would be the visitors’ center and point of entry. From there, visitors could board a steam train that would go some short distance into the valley, to the first and perhaps the second nineteenth century town, which would be visitor oriented and easily accessible by many people. The next town would be about five miles farther in, without public transportation but still not too hard to reach with moderate effort. Towns after that would be about ten miles apart, progressively smaller and more remote, with their architectural references progressively farther back in the past, and designed to appeal to progressively more demanding types of outdoors-oriented people. Although modern power would not generally be used in the valley, some exceptions will be made for important reasons of public safety, such as emergency radios, medical services, or town water and sewer systems. The towns would be linked together with the low-intensity infrastructure appropriate to the nineteenth century: steam trains to the first towns, paved roads for bicycles and farm wagons to the next towns, and dirt roads or footpaths to the later ones. Dams, irrigation ditches, and agricultural fields might extend for a few miles outside some towns. But much of the space between the towns would remain undeveloped, to preserve the memory of how close to the wilds and how much on the margin the pioneer settlements actually were. Visitors and homebuyers would find much to like in these towns. Some will value the towns’ unique period architectural qualities – the set of features like awnings and porches that have been superseded by newer technologies, or that we have simply forgotten about but can relearn. Other visitors will value the different types of social interaction that will take place in a world without cars and electricity. Still others will value the way that the spacing of the towns permits easy access to the surrounding wilderness, and permits venturesome travel around the valley by a variety of means, such a hiking, bicycling, or horseback riding. 2. The second town would use a more place-specific Western architecture of 1905. It could also be reached by train, but on a schedule that requires overnight stays, thus beginning the process of making the towns increasingly remote. This town would have a permanent population of perhaps 300. The first two towns would both be accessible to handicapped visitors. 4. The fourth town would require an additional, slightly longer step of eight miles. It would use the architecture of 1880 and would have a population of 150. 5. The next town would be of the same time period — about 1880 — but instead of being a “balanced” community it would have the specialized architecture and layout of the type of working settlement most characteristic of the area where the particular valley is located — mining, for example — and a population of about 100. No public transportation would serve this or later towns. 6. The next town would have the more primitive architecture of an early pioneer settlement of around 1850, and a population of 75. 7. The seventh town would be about ten miles further by footpath and would be an Indian pueblo (or whatever other building form was historically appropriate to the particular site) with a population of 50. 8. The last town would be about fifteen miles further along and would be a village of archaic Indian pit houses or teepes, with a seasonal population of about 25. Beyond this town the traveler would emerge from the far end of the historic area and could find transportation back to the starting point. So that travel will convey a sense of moving to progressively more remote locations, it might be good to route the path through a “one-way” obstacle, such as a ten-foot slickrock slide or a long hike to the first town, to discourage (although not prohibit) entry from the far end of the valley. 1. Farm fields might extend for a short distance around some of the first towns. This would provide a way of demonstrating some old agricultural techniques such as the use of irrigation ditches. 2. 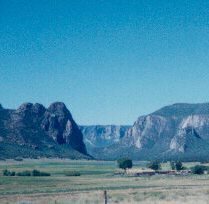 Other, broader tracts at the near end of the valley could be kept as open range for cattle ranching. 3. Land farther along the valley floor might be left in its natural state but on terms that permit the use of certain types of historically appropriate mechanical devices. This would permit things like supply wagons for the towns and chuck wagons or other support vehicles for tour groups. 4. Most lands on the slopes of the valley sides would be wilderness, so as to effectively buffer the valley from the outside world. Cherrystemmed routes for bicycles might be permitted on one side of the valley but not both sides. 5. Finally, land at the far end of the valley floor would also be wilderness. Even if this land shows signs of prior habitation, those should be removed so as to permit that designation. This wilderness will be especially valuable for conservation purposes, since it will include the kind of valley bottom that does not nomally qualify under the 1964 Act, and since it will thereby encompass an entire ecosystem at all elevations. One exception to the wilderness designation should be made, however, in order to retain the main through trail linking the string of historic towns. The variety of the towns and countryside will permit visitors to use this valley in a variety of ways. Some visitors will select a town that suits them and will spend several days there, exploring the area or perhaps just relaxing. More active visitors will hike the entire sequence of towns over the space of a week, enjoying the sense of moving back into a progressively wilder and more remote past. Still others will spend time hunting, rafting, or backpacking in the surrounding wild lands, and visiting the towns only for fresh supplies at intervals of several days. The historic area may also attract other, more specialized visitors who are interested in particular activities or technologies showcased there. These could include followers of steam trains, working horses, or pioneer history. Other specialized groups of visitors may be those who come in particular organizational ways. School tours and European visitors may constitute large and important groups of users. “Adventure travel” groups may bring in additional people who would not necessarily travel on their own; indeed, the historic area seems particularly well suited to that industry’s style of travel. No matter how a particular visitor elects to use the historic area, the defining fact of the experience will be the same: A visitor will be able to spend a week here, and to travel through seven towns and seventy miles, and in all that time will never see a single car or a single electric light. The most important step is to ensure that the new towns have a diverse population and a variety of economic activities. It is probably inevitable that the first group of permanent residents will be people who see an opportunity in providing visitors with hotels, restaurants, and guide services. Later town residents may include a wider variety of people, however, including some who already live in the immediate area, and others who will trade with area residents in a diversified range of transactions. These new residents could include retirees, students at newly established branch campuses of state universities, people in the crafts, people practicing professions that don’t require modern power (such as grinding mirrors for the Hubble space telescope), and current county residents who simply prefer this way of life. Farmers or ranchers in the area could profit from a new management philosophy toward lessees. The valley might be used to test two new ways of privatizing BLM land for the benefit of current users, subject to conservation easements. These tests would explore a view that the federal government may have a strong and legitimate interest in seeing that lands are used in certain ways — such as for open space — but it does not necessarily have the same interest in being a landlord. The first test might involve some land near the starting end of the valley — in the neighborhood of the first towns — which might be privatized for a nominal fee to the rancher(s) who are presently are or could be leasing it from the BLM. This privatization would be subject to conservation easements in order to ensure that the lands remain open. The ranchers will nonetheless benefit by becoming able to run their day-to-day operations without a government agency watching over their shoulder. In the second test, other land might be privatized for the creation of the period farms, even if those do not exist at present due to the absence of suitable water. If these forms of privatization produce problems they need not be repeated, but if they are successful here they might be replicated elsewhere in the West. All current county residents might be offered passes on the railroad to compensate them for the loss of ready access to the valley. Passes might be good for free travel for a certain period, and then reduced-price travel for a subsequent period. This may help give county residents good access to the historic area and a stake in its success. Finally, the business community and local governments could benefit insofar as the towns become a source of tourism and other economic growth. A study by the Utah state government reports that 21 percent of the state’s visitors go to historic sites, only slightly less than the 25 percent that go to State or National Parks. The valley could take good advantage of both those potentials since it will offer something that combines both types of experience. Since the defining feature of the historic development zone is the new towns, it is worth taking a moment to discuss some of the practical issues involved in constructing them. Three questions appear particularly important: (1) How do we keep the towns authentic enough to be attractive to visitors? (2) How do we keep them diverse enough in their architecture to look like real places? And most important of all, (3) How do we ensure that the towns are practical to construct and economically viable? 1. Authenticity – Authenticity will be one challenge to the developer’s imagination, but it may be relatively easy to solve. Nothing will make the towns genuinely old, of course, but their look and feel can be convincing if architects work from a portfolio of authentic period materials and design elements, which can then be combined in novel ways. Similarly, the overall plans for each town can be laid out using period principles of community design. There is a risk that too much attention to the letter of authenticity could kill the spirit – that the towns would end up with a polished, artificial perfection quite unlike real places. This can be avoided by encouraging some of the grittier elements of “authentic” design, including non-professional architecture and even the use of some secondhand or shoddy materials. It can also be avoided by encouraging some individualized, divergent modifications of properties in the hands of different owners. 2. Architectural diversity — Architectural diversity is also something that needs to be thought about. Since these towns will all be constructed new, during a relatively narrow period of time, there is a risk that they will inadvertently reflect some unduly uniform design philosophy. This concern could be addressed by seeking out variation both in town formats and in project managers. We have already discussed how the different towns would follow somewhat different historical formats. If additional towns are ever built, still other formats might also be considered. These variants could include some following the traditional Utah plan of large lots for vegetable gardens, or a few that forego all historical references and can serve as demonstration sites for high-tech forms of alternative energy. Variety can also be pursued by having the towns developed by different project managers. In some cases the Interior Department might manage a town project directly, but in other cases it might better delegate the work to an independent developer. Different developers would work within general guidelines and under the supervision of the Park Service, but they would bring a variety of specific approaches. 3. Economic viability — A beautiful historic zone is nice, but doesn’t necessarily pay the bills. So the final question is whether this project will be economically viable, both for the nineteenth century towns and for the developing entities. This would be a central subject of any feasibility study, which is an important next step in this project. Provisionally, however, there are at least six ways that the project design can be adjusted so as to maximize the economic prospects for the towns. First, and most importantly, we can plan the towns around some carefully chosen and uniquely beautiful scenery. If location counts for much, these towns will have some of the best locations in the world. In addition, by establishing the groundrules of the nineteenth century area through statute, the government would in effect establish building covenants with a detail and geographic scope that could never be matched in a private transaction. Both things should help make properties in the pioneer-era towns uniquely appealing to buyers. Dartmoor National Park in England has a somewhat similar pattern of wild moorland on the high ground, separating valleys with farms and small towns. It attracts 872,000 overnight visitors a year, who contribute about $33 million to the local economy. Second, we can design the appearance and infrastructure of the towns in such a way as to bring a wide variety of people there, as either visitors or residents. This diversified economic base is probably safer than having the economy wholly dependent on tourism. The state government could probably do a good deal to ensure the viability of the towns by locating a few governmental facilities there. The rules of the towns should be drafted to encourage rather than to thwart this kind of diversification. Third, the towns can be kept viable by not putting property up for sale (or, technically, up for long-term lease) faster than the market can absorb it. There probably is some minimum viable scale for each town, large enough to support a few travelers’ facilities. Once these very modest threshold requirements are met, however, further development of new blocks or additional towns need take place only as the market demands it. The transportation system might also begin with a simple form, such as a diesel-powered trolley, and progress to a full steam train only as demand warrants. In short, we can help to ensure the viability of the project by not thinking that we have to rush things. Fourth, we can set the zoning rules so as to permit some reasonable level of amenities in the towns — particularly in the first, most visitor-accessible town. Houses can then be sold to a relatively broad public rather than to just a devotee subgroup. Nothing in the rules of the area has to prevent the use of familiar packaged foods, for example, and those can be easily imported by rail. In time this town might also operate municipal utility systems, when and if the population becomes large enough to justify it. Those could provide things like illuminating gas or horse-drawn trolleys. In addition, all of the towns will probably be large enough to support businesses providing specialized conveniences, such as ice deliveries and restaurants. Carefully-hidden modern power might be used to provide a few core services, such as water, ice manufacture, emergency communications, and a town laundry. In these ways life in the towns can be made far more comfortable than it would have been on an isolated nineteenth century farm. Fifth, the capital costs of the towns could be reduced by looking imaginatively for contributions from other agencies that have appropriate missions. We might approach the Smithsonian for useful historic artifacts, for example, or a corporation or ethnic association for objects showing its ties with the frontier West. Sixth, the federal government could aid the project by guaranteeing the railroad and water systems. The railroad is needed to provide an historic type of access and economic viability to the towns. And the importance of water to public health means that we will want to bring water and sewer service to all the new towns through modern technology. This could be done by deep-well drilling, or purchasing water rights in some other form. The federal government might justify this expenditure on the ground that it is the price of creating a desirable new type of park, and that it may also lead to further public benefits by suggesting a way out of the wilderness deadlock. In the longer run, moreover, the government is likely to recover its investment in this infrastructure when it sells or leases the building lots in the towns, since its investments will have made those lots valuable, and some of that newly-created value will be captured when the lots are sold. This doesn’t mean that the federal government should create the towns just as a money-making venture. However, if it creates the towns for other, historic- preservation reasons, then it would be an added benefit if the project paid for itself or even turned a profit, as this one might do. In the long run, the real danger facing the towns may turn out to be too much demand, rather than too little. To maintain the long-term economic viability of the towns it may be necessary to address the “Aspen problem” – the situation where most houses have been bought by absentee owners and none are available for local workers. To solve this problem the zoning rules may call for some neighborhoods of relatively small houses, like the two-room Victorian miners’ houses in Colorado, and some other areas of boarding houses or residential hotels, which could be suitable for younger people in seasonal jobs. It would be desirable for the historic area to have the support and assistance of the organized historic preservation community. Doing so will give the project access to special skills and expertise, and will help ensure the kind of low-key integrity of design that will make the area valuable to visitors. This will be something of a new line of work for the preservationists. The towns would be new creations rather than real buildings from the nation’s past. Some might urge that the historic preservation movement has accomplished all that it has precisely by staying with the original and the authentic, and that it should not become involved with a construction task like this one. First of all, the proposed area will present the really important intangible elements of the nineteenth century in an authentic way. By building the brick-and-mortar aspects of the area new, we can assure that it is in a location free from inconsistent modern uses, and thus we can more accurately convey the intangible aspects of a prior period. The quiet will be genuine quiet; the horse-drawn wagon will be a genuine form of transportation; and the band concert that people attend in lieu of watching television will be a genuine, and different, form of social interaction. These intangible aspects of the past seem like a necessary element in a complete historical understanding. Since they are not currently presented at any historic site, the marginal value of their first presentation will be especially high. They should therefore make this area an interesting and sought-after destination for heritage tourism. Second, some towns in the historic area may be entirely genuine nineteenth century ghost towns, which have fallen so deeply into disuse that it is now feasible to incorporate them into the area. Their population may have fallen to only a few people or perhaps none at all. Such a town may contain extensive remains of old buildings, which could be preserved, or rehabilitated, or reconstructed, as appropriate. The town as a whole then could serve as the transition point between the modern and the period worlds. Third, some of the new towns could be built on small but genuine sites of former settlement. They could be built around a preserved stagecoach station, or a ranch house, or a mining facility. New towns of this kind would usually extend beyond the limits that the old settlements originally had. However, the original settlements will still provide a location, a name, a core building, and a history that can be remembered. Fourth, even entirely new towns can incorporate a number of authentic buildings and artifacts that have been moved in from elsewhere. For example, endangered historic buildings could be moved here from other sites. On a smaller scale, period machines — such as telegraph or heliograph machines for communications — might also be moved in. What these facilities would lose in terms of their original geographical context they would gain in terms of a more appropriate technological and functional context, since visitors will see them once more being used as they were intended to be used. The frontier area may eventually become home to a wide variety of period artifacts from around the country, such as windmills, irrigation gates, or railroad operating equipment. Fifth, and finally, the historic area can be viewed in another light altogether. Even if its towns are thought not to be a form of pure “historic preservation,” they are without question a form of historic education or historic interpretation. They are a way to help visitors understand the meaning and original nature of the genuine historic sites that they encounter elsewhere. And that in itself seems like an important and legitimate purpose. Consider the example of Mount Vernon. The building itself is perfectly authentic. If George Washington were to return, however, he would find the experience enormously altered by the presence of easy road access, large crowds, and airliners flying down the Potomac every two minutes. These innovations are tremendous departures from the original historical “truth;” but are ones that are familiar to the people of our generation, and so we have tacitly agreed to disregard them. George Washington himself might well believe that an alternative “Mount Vernon II,” reconstructed a hundred miles away, with access only by water or a long carriage ride, with no air traffic, and surrounded by a plantation being worked with period techniques, was actually the more accurate representation of his home. But the best solution of all is to have both places, to preserve both aspects of the past. While the frontier area will benefit most users of the public lands, a few groups will be disadvantaged. We should make provision to compensate these people for their losses, using adjacent lands just outside the frontier area. This could be done as part of the same management plan in order to concretely show that no group will suffer a net loss. Our greatest concern will be for members of the off-highway vehicle community, since their jeeps will lose access to the non-motorized frontier area. To offset this, members of the OHV community will be invited to help lay out interesting and challenging new routes in an area just across one ridgeline defining the historic valley. Much of this construction would be done by the jeep community itself, but some federal money might also be available. The new routes, designed from the beginning for recreational purposes, should be more scenic and more technically challenging than the current inventory of jeep roads, which were for the most part built for utilitarian purposes and therefore take the simplest route from Point A to Point B. Some of the new routes might go to particularly attractive points that are at the “end of the line,” and that would not have been served by purely functional roads. Other routes might be designed for interesting and perhaps even hair-raising technical challenges, and so might follow narrow ledges, go over narrow trestles, pass through old mine tunnels (structurally shored up but pitch-black), and generally give expression to the imagination of the trail designer. Still other routes might be laid out with campgrounds or to facilitate rally events. The super OHV routes would be several miles apart, so as to include blocks of wild land between them (and to ensure that the routes pass through wild lands), and thereby serve conservation values as well. By building in this way, the users of off-highway vehicles can benefit from a policy of having “fewer but better” facilities. One special quality of the original frontier was its sense of the unknown, of adventure and discovery. That is now missing from our well-mapped public lands. Some part of this sense might be re-created by establishing some concrete goals and destinations for those people who want to pursue them. 1. We could commission a set of four statues of angels — to be made of marble, bronze, silver, and gold — and set them up in locations that make worthy goals for hikers. The marble angel could be in the first town, a three-mile hike away, and thus a suitable goal for children. The bronze angel could be in the town at the mid-point of the valley. The silver angel could be in the last town, a reward for the traveler who has managed the entire distance. And the gold statue could be in an unannounced location, off the road, hidden somewhere in the frontier area (and moved when its location becomes known) as a goal for people who wish to explore the obscure corners of the countryside. 2. We could require that the wilderness area at the far end of the valley be left blank on maps. With suitable legislation this might be required of all mapmakers, and justified by a public purpose of preserving some mystery. Even without legislation it could be followed as the policy of federal programs. 3. We might establish one additional small town, off of the main road, with the proviso that it too not be shown on any map. 1. Economic feasbility study — We should obtain a careful, serious estimate of the historic area’s economic viability. This would involve learning things such as what numbers of people would want to come; how long they would stay; what they would want to do; how much they would plan to spend; and what a real estate market would look like in consequence. The study would also involve talks with specialists to obtain better estimates of the costs of the two main infrastructure items: water lines and rail tracks. Special attention should be paid to identifying techniques that will let us control or live with whatever uncertainties inevitably remain. These might include ways of generating our own demand through the facilities that we offer, and ways of compensating for uncertainties in demand by developing the facilities in incremental and scaleable ways. 2. Study of conservation values — We should also obtain careful, serious estimates of the way the plan would affect conservation values in the valley. We should speak with members of the hiking and wilderness communities to see how the area could be designed to assist their activities in some cases, and not to hinder them in others. We should ask similar questions of the more broad-based population that supports the National Parks. And we should conduct wildlife studies to see whether (and how) the new valley could be laid out so as to minimize any impacts on animal populations, and whether any particular harms can be offset by increased conservation measures adoped elsewhere as part of a single management package. 3. Selection of management structure — Finally, we should devise a suitable management structure for the frontier area. In order to reflect the broader-than-usual mix of vistior and resident interests that will be served there, it might be worth considering a board that includes BLM, the Park Service, the Forest Service, and the local county government. Thus while the valley will function in many ways like a new kind of national park, it will be managed in its own unique way. The rural West is filling in rapidly. If historic preservation is ever to be done on any kind of a large scale, it must be done soon. The approach proposed here has the essence of any really good solution in that it lets each party get most of the things it needs. The historic valley can accomplish this because the parties’ true needs relate to different parts of the area. The conservation community values extensive, contiguous acreage of suitable land, and it will find that about 96 percent of the land will be devoted to it. Local governments value economic development, and they will find that the 1 percent of the land that is devoted to towns is actually the space best adapted to maximizing jobs and economic activity. The historic-preservation community will value the entire inhabited 4 percent — the towns and the irrigated farmlands around them — as well as the valley as a whole. This new place should be managed as a new type of land use, a National Frontier Area. That is something we could all take a lot of pride in bringing about.